International wildlife trade group Traffic says that more elephant tusks were seized in 2011 than in any year since 1989, when the ivory trade was banned. Traffic said elephants have had a “horrible year”, with 23 tones of ivory seized – representing at least 2,500 dead animals. Trade in ivory was banned in 1989 to save elephants from extinction. But it has continued illegally because of huge demand in Asia, where it is used to make decorative objects. “The escalating large ivory quantities involved in 2011 reflect both a rising demand in Asia and the increasing sophistication of the criminal gangs behind the trafficking,” said a statement from Traffic, which monitors the trade in wildlife products. Traffic said there had been at least 13 large seizures of ivory this year, amounting to more than 23 tones, compared to six last year of less than 10 tones. “In 23 years of compiling ivory seizure data… this is the worst year ever for large ivory seizures. 2011 has truly been a horrible year for elephants,” Traffic’s elephant expert Tom Milliken said. 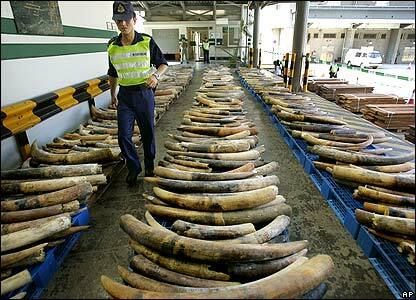 The group said the smugglers appear to have shifted away from using air to sea – in early 2011, three of the large scale ivory seizures were at airports but later in the year most were found in sea freight. “The only common denominator in the trafficking is that the ivory departs Africa and arrives in Asia, but the routes are constantly changing, presumably reflecting where the smugglers gamble on being their best chance of eluding detection,” it said. In six of the large 2011 seizures, Malaysia was a transit country in the supply chain, Traffic said. In the most recent case on 21 December, Malaysian authorities seized hundreds of African elephant tusks worth about $1.3 million that were being shipped to Cambodia. The ivory was hidden in containers of handicrafts from Kenya’s Mombasa port, Traffic said. Tom Milliken said despite the seizures, there were generally few arrests. “I fear the criminals are winning,” Tom Milliken said. Some environmental campaigners say the decision to allow some southern African countries, whose elephants populations are booming, to sell their stockpiles of ivory has fuelled the illegal trade. Those countries – South Africa, Botswana, Namibia and Zimbabwe – however, deny this and argue they should be rewarded for looking after their elephant populations.